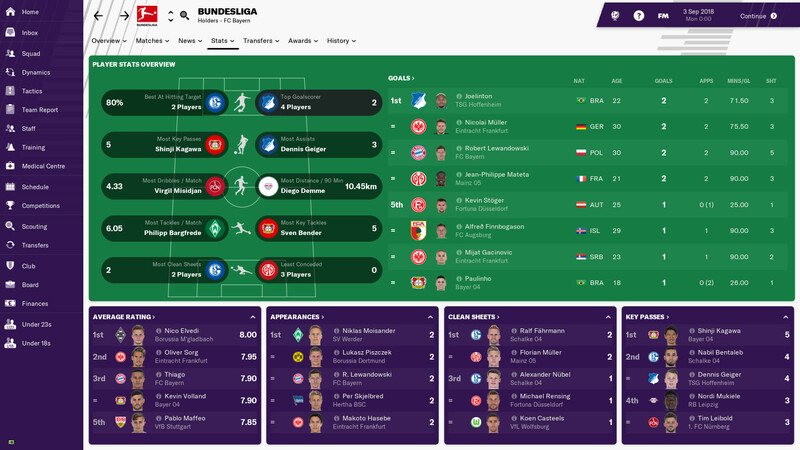 For those without much free time or a pre-existing, intimate understanding of its framework, understanding Football Manager’s enormous locker room of riches has been a problem. You might be the most eager wannabe digital gaffer of all time, but if you can’t digest the tools required to motivate players, scout new ones and combine their skills on the pitch, then your only legacy will be as perennial leader of the sack race. This season, developer Sports Interactive has worked hard, and come out victorious, in their quest to improve the way they present the possibilities offered by their annual franchise. It’s easier than ever to be drawn into the world of Football Manager 2019, and set about becoming the next Pep Guardiola — or perhaps for the more modest and realistic amongst us, the next Steve Cotterill. 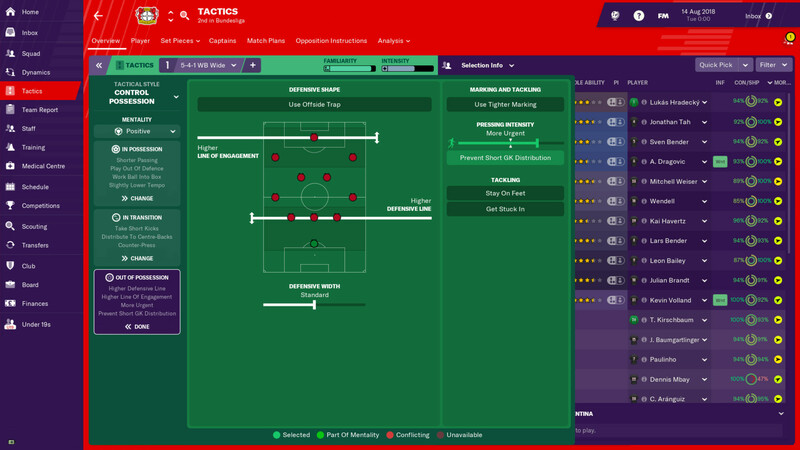 Inductions for concepts surrounding tactics, scouting, player training and more have been included, to highlight both the importance of these elements and how you’re able to customise them to your liking. Whilst they essentially amount to tutorial sequences, inductions are valuable for both new managers and returning ones like myself. More time can be spent on executing new features and interacting with your squad, with less time wasted on uncovering the impact of said features through trial and error. Rather than working out how to play the game, then, you can concentrate immediately on how to define it to your liking. Given how much impact your early decisions have on the path of your managerial career, the importance of this can’t be understated. Frankly, it’s nice to finally have the kind of educational features that should have been a mainstay long ago. 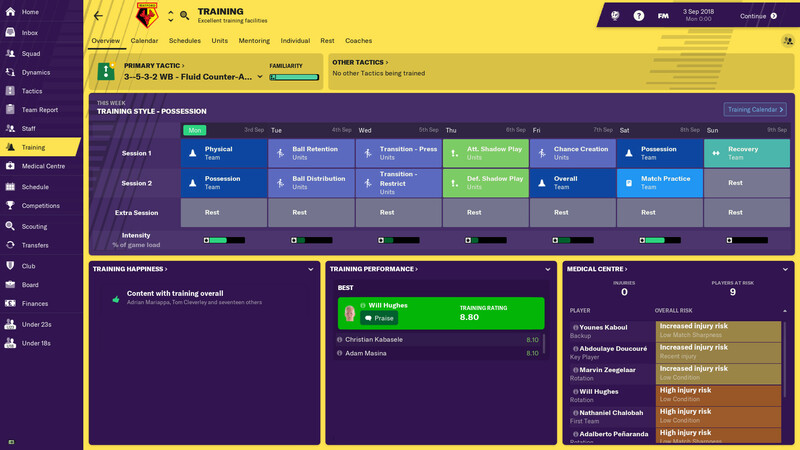 Teaching you how to influence your team is one thing, but Football Manager 2019 has also expanded, intelligently and meaningfully, the forms of that influence. The tactical options are perhaps the best example of this, with the range of commands buffed up to allow you to try your hand at implementing concepts that are mainstays of football hipster conservations across the world (read: across Twitter). You’ve now three distinct phases to setup within your overall tactical approach, covering when those times when you’re in possession, when you’re not, and the briefer instances in which you’re transitioning between the two. For example, when you lose possession you can, amongst other things, ask your team to immediately fall back into their defensive shape, or to be more aggressive and take risks to win the ball back quickly. What you decide will be determined by the type of players at your disposal, how much you trust them, and what sort of wider footballing philosophy you want to embrace. Help in defining a philosophy comes in the form of tactical styles that you can implement at the click of a button, ranging from the ultra-defensive Mourinho-favoured parking of the bus, to the more progressive gegenpressing approach that sees your strikers defend from the front a la Klopp’s Liverpool. Your choice will inform a selection of styles that govern the basics of how your team operates as a unit, from what kind of passes they play in attack to how wide or narrow of an overall shape you adopt; from how you want your goalkeeper to distribute the ball to how high of a defensive line you’d like to keep. All of these instructions can be set manually should you want to tread your own path entirely, but the existence of pre-defined strategies helps as both a learning tool and a source of inspiration for how and why you might want to gift a new tactical approach to the digital footballing world. 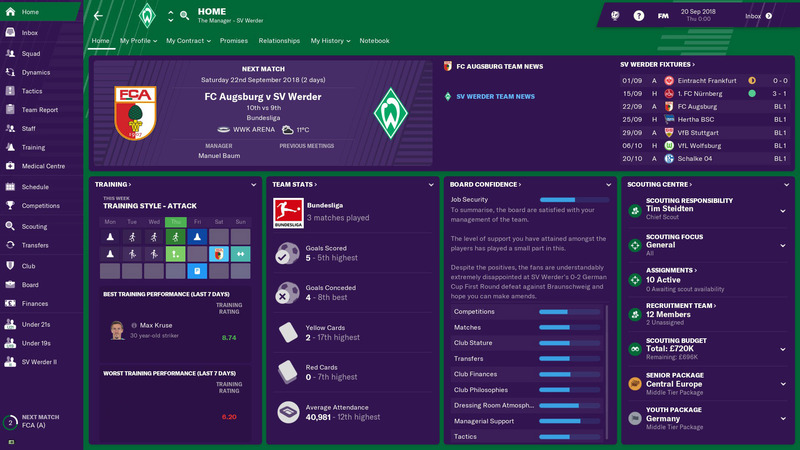 Given the increased quality and popularity of football coverage that focuses on tactics and strategy over all else, it’s nice to see Football Manager’s tactical features reflect the changing standards and norms of how the sport is discussed elsewhere. Training has seen similarly exhaustive additions, with you now able to define three sessions per day across an enormous range of different activities. The depth that you can go into here is head spinning and, while the associated induction does a good job of explaining the basics, the sheer number of different possible setups means your best bet is to talk to other players about their approach and understand what has and hasn’t worked for them. Knowledge sharing of this sort is the only way to fully grasp the potential of what’s on offer given the open-ended nature of the design, a fact that stands as shining testament to the depth that Sports Interactive is capable of offering. As in the real world of football, studying other managers is one of the best ways to improve. You’re still free, so long as you’re managing a team with a balance sheet healthy enough to hire quality staff, to delegate training duties to your coaches, but it does pay to try your hand at micromanaging it initially. In doing so you gain a better understanding of the impacts of training and, as such, you’re better equipped to provide top level instructions to the coaches responsible for improving your players between match days and in your youth squads. 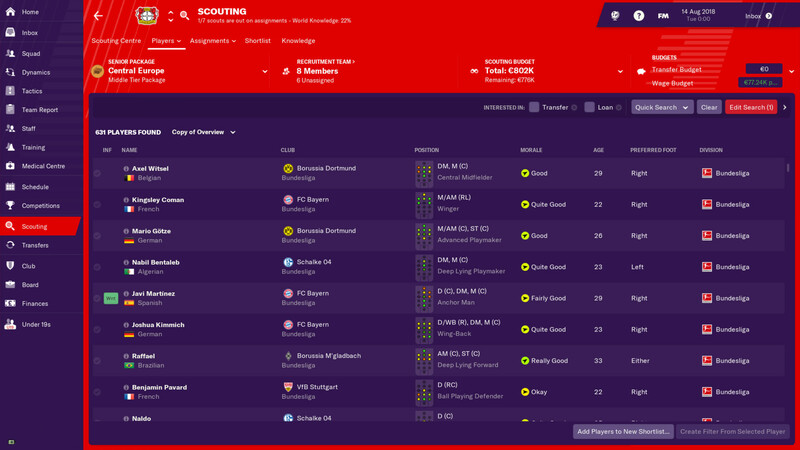 Through the inductions, as well as the tweaks to how the available depth is presented and celebrated, Football Manager 2019 represents a high point in the series’ openness and accessibility. Most importantly, there’s a delicacy on show here that means this more welcoming path to the game’s core is achieved without undermining the pillars of realism, diversity and expansiveness that have resulted in the series’ success up until now. If you don’t want to drill into the nitty gritty of training then that’s fine and totally legitimate, but only by understanding what’s on offer can you define the perfect experience for you from the available options. The path to understanding has never been more attractive, Football Manager 2019 offering the best experience the series has yet to provide thanks to intelligent, subtle changes in its form rather than its content. You might go in dreaming of being the next Steve Cotterill, but Football Manager 2019 makes you want to be Pep Guardiola. Tagged with feature, review, Sega, Sports Interactive, wot i think, Football Manager 2019.